After Viral Scandals, Airline Bumping Rates Hit Historic Lows : The Two-Way A marked decrease in the airline bumping rate started in April, according to new data from the Department of Transportation. That's the month a passenger was bloodied and dragged off a United flight. United Airlines garnered headlines in April when a passenger was dragged off a plane after the airline attempted to bump him from the flight. 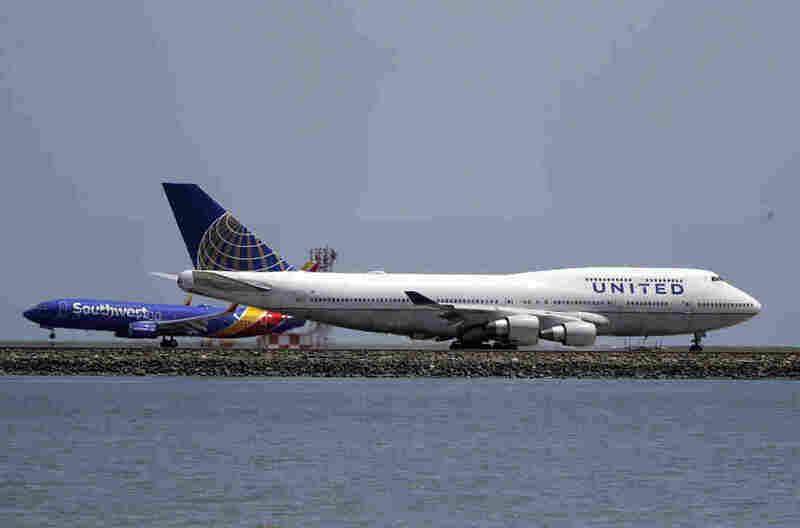 It might seem like vocal discontent about airline bumping has reached a high-water mark recently, especially after a passenger was bloodied and dragged off a United flight last April. Now, new data from the U.S. Department of Transportation shows that bumped-passenger rates are at their lowest level since 1995. For the first three months of 2017, passengers were involuntarily denied boarding at a rate of 0.62 per 10,000. That markedly decreased starting in April, the same month David Dao was forced off the United flight. The second quarter of 2017 saw a bump rate of 0.44 per 10,000. According to the new report, complaints about airline service are up. In the first six months of 2017, the department has received 9,026 consumer complaints, a 7.8 percent increase from the first six months of last year. However, the annual 2017 North America Airline Satisfaction Study by market research firm J.D. Power released in May found that overall customer satisfaction with commercial airlines is at its highest level in 13 years, as NPR's David Schaper reported. United has apologized for the high-profile April incident and reached an "amicable settlement" with Dao for his injuries. "It was a mistake of epic proportions," United CEO Oscar Munoz told members of Congress in May at a hearing on customer service problems in the commercial airline industry. "In hindsight, clearly our policies broke down." "One change is that United will reduce overbooking of flights in order to limit the need to 'bump' passengers to a later flight. "When it does overbook, United will now offer up to $10,000 to passengers who volunteer to be bumped. The intention is to limit the need to involuntarily bump passengers, as happened in the April 9 dragging incident. "United also says that the airline will no longer call on airport police or other law enforcement personnel to handle these kinds of matters, unless safety and security are at risk." This incident is not the only recent airline dispute to go viral. For example, an American Airlines employee in April was accused of knocking a woman with a stroller as she held a baby in her arms. Last month, United apologized for making a passenger give up a paid seat for her toddler to a standby passenger, forcing her to hold the child on her lap for the duration of the flight. On-time performance in June 2017 was slightly down from the same month last year (on-time arrival for 76.2 percent of flights compared with 78 percent last year), and flight cancellations were slightly up this year compared with the same month last year (1.1 percent of scheduled domestic flights compared with 1.0 percent last June). The data is a compilation of information from 12 U.S. carriers. In June, the last month of data, Hawaiian Airlines had the highest on-time arrival rate and JetBlue Airways had the lowest.